mentha archives evidence collected from different sources and presents these data in a complete and comprehensive way. Its data comes from manually curated protein-protein interaction databases that have adhered to the IMEx consortium. The aggregated data forms an interactome which includes many organisms. 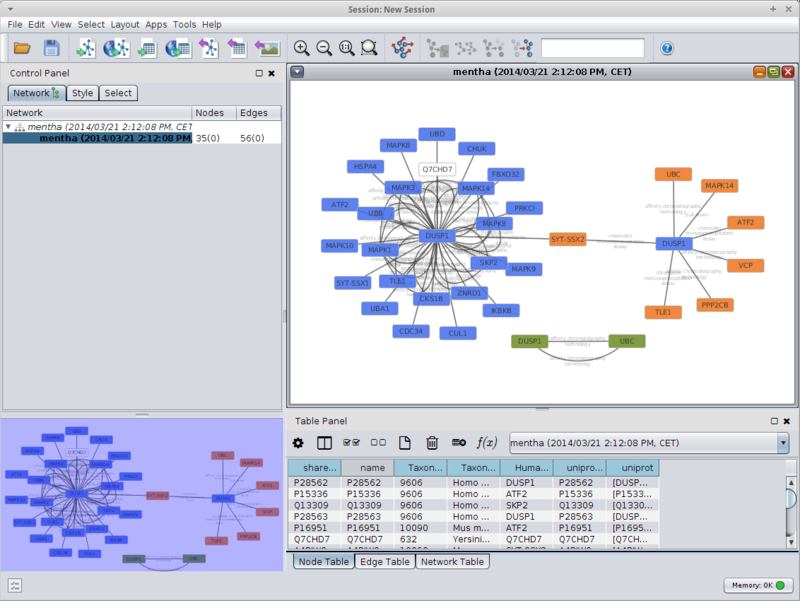 mentha is a resource that offers a series of tools to analyse selected proteins in the context of a network of interactions. Protein interaction databases archive protein-protein interaction (PPI) information from published articles. However, no database alone has sufficient literature coverage to offer a complete resource to investigate "the interactome". mentha's approach generates every week a consistent interactome (graph). Most importantly, the procedure assigns to each interaction a reliability score that takes into account all the supporting evidence. mentha offers eight interactomes (Homo sapiens, Arabidopsis thaliana, Caenorhabditis elegans, Drosophila melanogaster, Escherichia coli K12, Mus musculus, Rattus norvegicus, Saccharomyces cerevisiae) plus a global netowrk that comprises every organism, including those not mentioned. The website and the graphical application are designed to make the data stored in mentha accessible and analysable to all users. Our service displays content extracted from different sources. This content is responsibility of the entity that makes it available. mentha integrates these databases because of their characteristics. They all use the same curation policies and the same complex expansion model. "Oncodiet" grant from the Fondo per gli Investimenti della Ricerca di Base (FIRB) project. The search field in the home page can be used to search gene names, UniProt IDs or keywords. In the home page you can also find a drop-down menu to select a model organism to narrow down your search. Gene names such as: PTPN1, AKT1 and so on. By clicking search you will be presented with possible results. You can collect proteins in the "Protein bag" by clicking “Add” or “Remove”. Protein can be remove from the "Protein bag" just by clicking them in the bag. Once you have added some proteins you can search again and continue adding. "List" will list all binary interactions in tabular format. "Preview" shows direct interaction, if any, among the collected proteins. 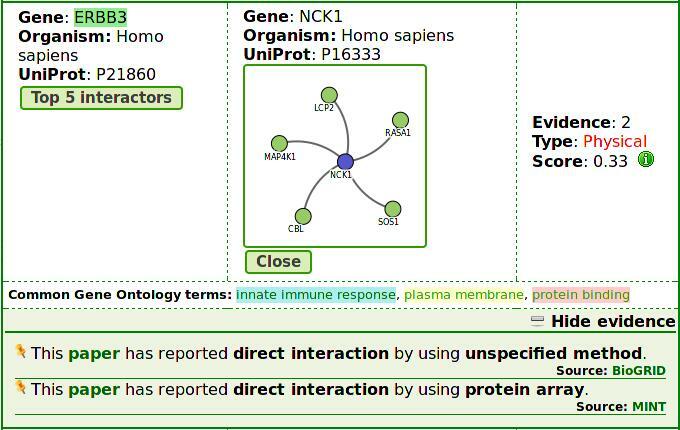 "Browse" starts the interactive Interactome Browser. The list page shows binary interaction with several details. Number of evidence, reliability score, interaction type (If any evidence to be enzymatic is available). Gene ontology terms highlighted in three colors by category: cellular compartment (yellow), molecular function(red) and biological process (blue). Clicking "Show evidence", the full list of scientific manuscripts is reported, with links to papers. Interactions can be easily imported in Cytoscape. 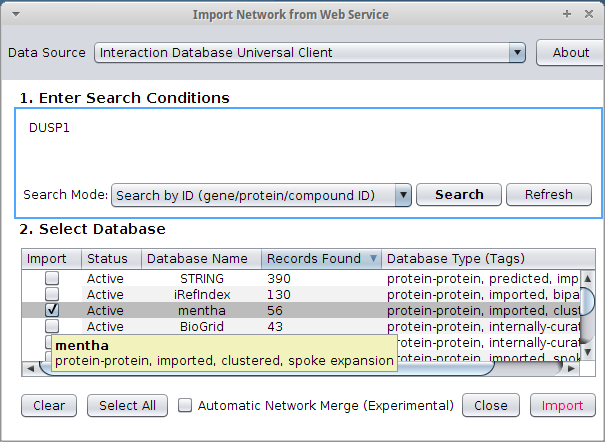 If you create a new network using an external database, mentha is one of the options provided by default. Once you have queired you proteins Cytoscape will assemble a network for you with all the details you need: experimental methods, references to articles and so on.